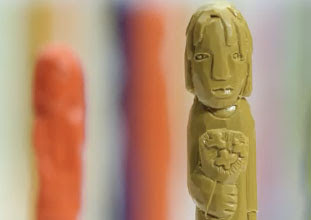 Artist Diem Chau has enjoyed a successful collaboration with US Cellular to make a national spot that features her wonderful crayon sculptures. It's refreshing to read on her blog how enjoyable the experience of working with a larger company in this way was for her, and how pleased she is with the results. I have never met Diem, but have admired her gentle and fascinating works in embroidery.